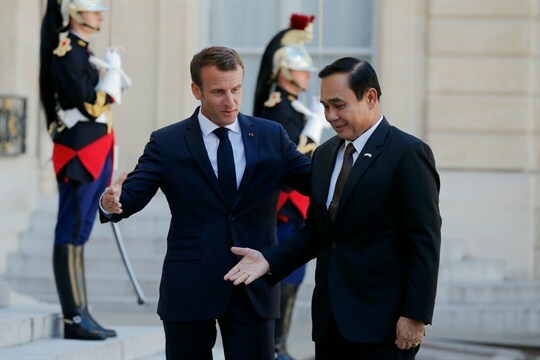 French President Emmanuel Macron welcomes Thai Prime Minister Prayuth Chan-ocha at the Elysee Palace in Paris, France, June 25, 2018 (AP photo by Michel Euler). More than four years after Thailand’s military seized power in a coup—the 19th coup or coup attempt since the end of absolute monarchy there in 1932—the country still seems far from a return to civilian rule. Since his putsch, junta leader Prayuth Chan-ocha has repeatedly promised that elections will be held, only to put them off again and again. Most recently, the junta allowed political parties to register earlier this year and suggested that new elections would be held by February 2019 at the latest. However, in recent weeks the military has again waffled on that date, and is now saying that elections could be held next May, or possibly later.